On a typical evening, Pycrofts Road looks like any other busy main road in Chennai. As motorists and other vehicles speed past an inconspicuous-looking building and pedestrians hurry home on a typical Friday evening, quite a few of them instantly gaze up and a look of amazement passes fleetingly on their faces. Some of them point out into the sky, while others come to a complete stop outside the building. Some even get down and enquire and as they do, hundreds and hundreds of feathery-little green parrots perched on the terrace of the building and on wires adjacent to it take flight. 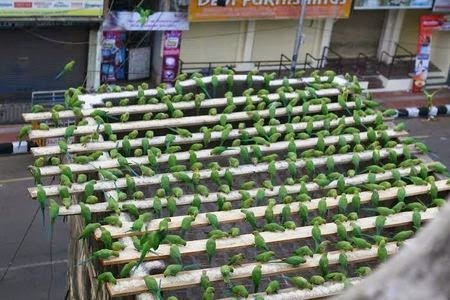 In a time where bird sightings in cities are in decline because of lack of natural habitats, the sheer number of parrots that land up every single day on the terrace of this particular building is astounding. It’s not just magic or plain luck though. The man behind this green sanctuary amidst an almost-concrete jungle in the city is C.Sekar, who has been feeding these parrots for well, over a decade. Dressed up in his trademark cap (probably to protect himself from bird poop), Sekar, a full-time camera technician said that feeding the parrots wasn’t something he had planned to do. It had started quite randomly during the aftermath of the 2004 tsunami. When the tsunami struck the east coast of India, villages were washed away, many people living along the sea line disappeared and animals were affected. “During that time, I found two parrots sitting on my terrace extremely tired and thirsty,” he said. “I fed them that day”. When he continued feeding them as a daily practice, the parrots returned, but with more of their tribe. The numbers on a typical busy evening are stupendous. “This is nothing. If you see in the morning there are even more parrots. That time there is not much traffic and noise disturbance,” he said. True to his word, the entire group takes flight disturbed by the sounds of a truck honking in the distance. However, they return to feed on the little mounds of soaked rice placed neatly on the terrace of Sekar’s house. 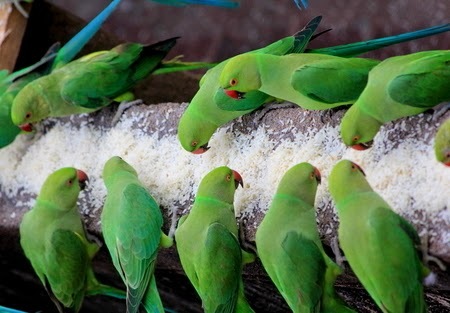 Sekar buys thirty kilos of rice just for the parrots every day; in all he spends almost Rs. 1000 just on food for his green-little friends each day. But even he couldn’t explain where so many parrots came from. “I think when they migrate from a place to another they pass by here.” He even explained a day on which two parrots were so tired and thirsty that they couldn’t fly onwards on their journey. “They rested on the terrace for a while, had water, and then continued,” he said. As he talks, he mentions that an unbelievable number of people stop and just stare at the sight before them. 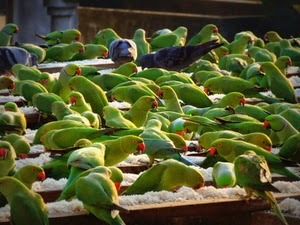 Some of them even try to disturb the parrots. “So every evening I stand down making sure no one harms the parrots,” he said. “Do people ask if it is a hobby to feed the poor and the homeless? 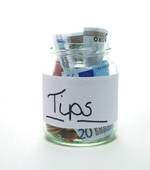 All these people only want to know how much it costs and whether I have a motive behind it,” he said. “I live in a rented house. My office is in the same building as my house here, “ Sekar said as he pointed to the same building. “I own a scooter and I have two grown-up children who are settled,” he said explaining his financial position.What does he get out of doing this? Happiness, maybe. We would think, satisfaction definitely.